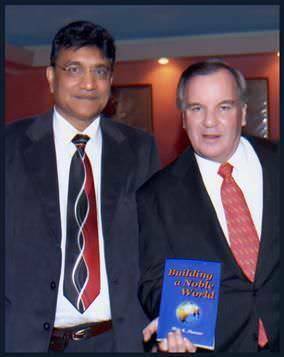 To promote peace and harmony across the world through meditation practice, Shiv R. Jhawar founded Noble World Foundation and wrote the book, Building a Noble World. The foundation is a 501(c)(3) tax-exempt, non-profit organization, providing education and inspiration to build a noble world. In June 2018, Shiv Jhawar was honored with the prestigious Albert Nelson Marquis Lifetime Achievement Award for his career achievements. Profiled in Wikipedia, Jhawar's academic and professional credentials are exceptional. He received a Bachelor of Commerce (Honors) degree in 1968, securing a position in the top ten merit list of the University of Calcutta. In 1970, he became a Chartered Accountant and a member of the Institute of Chartered Accountants of India. He served as a lecturer in commerce at H.R. College of Commerce and Economics, Mumbai during 1971-1973 before moving to the United States for higher studies. In the United States, Jhawar attended the University of Illinois at Urbana-Champaign where he earned a Master of Accounting Science degree in 1974. Upon graduating from the university, he came to Chicago, where he met Swami Muktananda, an eminent yogi and celebrated author of the book, Play of Consciousness. Recalling his dramatic kundalini energy awakening experience in the presence of Swami Muktananda on September 16, 1974, Jhawar writes, "Once you have an experience of transcendental reality, you are changed forever." In a week after the said spiritual birthday, Jhawar found a job as an accounts analyst with CBS Television in Chicago. In 1979, Jhawar qualified as an Enrolled Agent and began his private tax practice, where he remains today. Jhawar lives in Chicago and balances the pursuit of his professional goals with the practice of spirituality. He is a motivational speaker who blends spirituality, politics, history, and science in a unique and powerful way. Gifted with the ability to communicate profound concepts clearly, Jhawar has been giving talks both in the United States and abroad. You can send your message by clicking on Contact. Noble World Foundation (NWF) is a tax-exempt, non-profit organization founded in October 2004 in Illinois. Its mission is to promote the inner transformation of individuals for peace, harmony, and well-being in the world. Inner transformation means transforming the condition of the human mind, which is prone to human defects such as anger, lust, greed, infatuation, jealousy, and pride. Once these human defects leave the mind, the mind becomes profoundly peaceful and serene. Individuals who experience inner peace through meditation naturally radiate that peace into their surroundings, contributing to harmony and peace in the world. Individuals make a family, families make a society, societies make a nation, and nations make a world. Thus, individuals are the world. When individuals improve, the world automatically improves. NWF serves people of all races, creeds, and religions through this website. It offers various programs that lead people to the path of meditation. NWF is an all-volunteer-run charitable organization. Your donation to NWF is tax-deductible because it is a tax-exempt organization under section 501(c)(3) of the Internal Revenue Service Code.